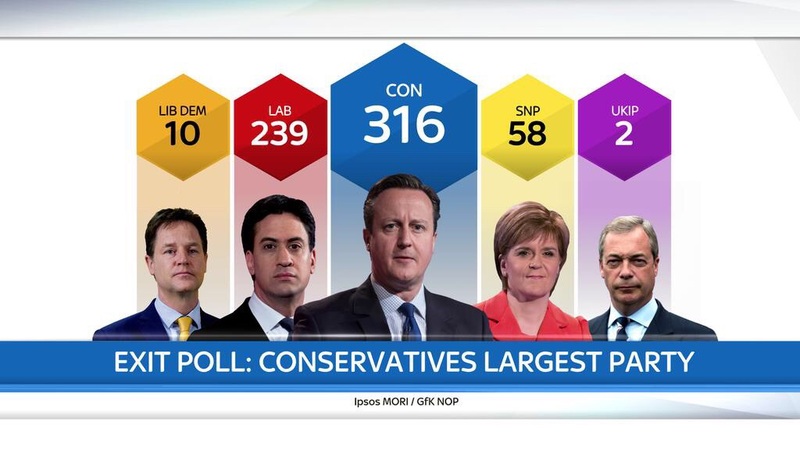 If the exit poll that has just been announced is right, we are heading for a Conservative Government. The exit poll has absolutely poleaxed political commentators and resulted in Kevin Maguire, from the Mirror, just tweeting the following line “Taxi for the polling industry”. 1) The Conservatives can, with just the Liberal Democrats, form a coalition that would mean they have a majority. 326 seats. They could invite the DUP to join them to get a bigger majority. It seems that the “Shy Tories” have come out of the woodwork and struck with a vengeance. 2) But, with 10 seats, the Lib Dems will probably not want to join the coalition, they will want to regroup. They may not have Nick Clegg as an MP anymore, and if he is one would imagine there might be a push to remove him as leader. So that leaves the DUP. 3) For Labour, it is just about their worst nightmare. 239 seats is way below anything they were considering, and makes it just about impossible for them to form a government. If this exit poll is true, after 5 million doorstep conversations and a campaign generally considered to be better than expected, they really need to take a very close look at themselves. 4) The main reason for the low number of seats Labour got is the SNP. Not only have the SNP got 58 seats, which means they only lost one seat in the entire country. What will happen now is anyone’s guess. Labour plus SNP = 297 seats and that won’t be enough, even if they add the small nationalist parties and the Greens. But still, you can bet those 58 SNP MPs will cause trouble. 5) UKIP will be disappointed, and the Greens may be too. It will be interesting to see what percentage of the vote each got to see just how much damage the vagaries of First Past the Post has done to them. But, bear this in mind. This is all true if the exit poll is correct. Paddy Ashdown, the ex-leader of the Liberal Democrats, has just said that if the exit poll is right he will eat his hat. We’ll see.